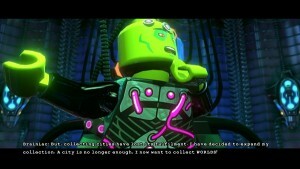 The LEGO games are perhaps the most simultaneously accessible and entertaining video games on the market today. They release on every system under the sun: past-gen, current-gen, home consoles and handhelds, even smart phones, and appeal to children, teenagers, and adults of all ages. The puzzles range from “insert tab A into slot B” to “now you’re thinking with Portals” and everything in between, and the wide range of unique abilities and endless cast of characters in each title never ceases to impress me. 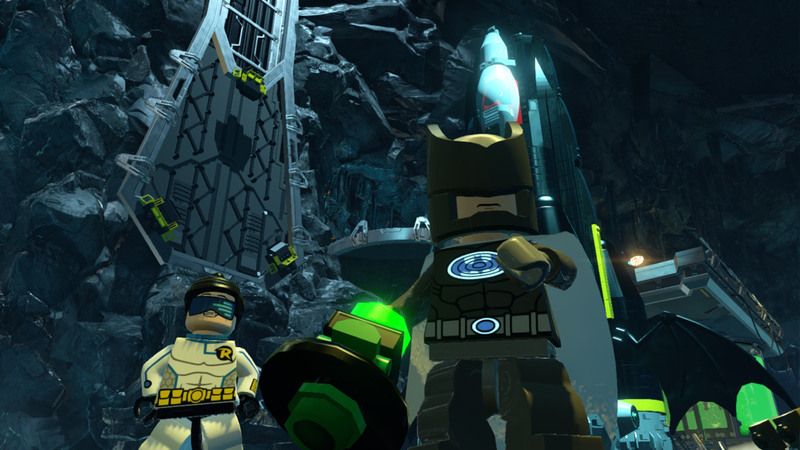 LEGO Batman 3: Beyond Gotham is no different, which is both its best and worst attribute. After thwarting Gotham City’s worst criminals in LEGO Batman and meeting the Justice League in LEGO Batman 2: DC Super Heroes, the band gets back together in LEGO Batman 3 to take down the sinister Brainiac, who is plotting to shrink the Earth and its most exotic cities and landmarks to store in bottles like model ships and put on display to inflate his ego. Typical evil mastermind. 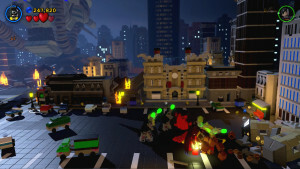 While other titles like LEGO Indiana Jones and LEGO Pirates of the Caribbean have pre-established scripts and films to follow and riff on, the LEGO Batman series of games must make up their own stories (and likely pull from the plethora of comic history) and tell them in fun and entertaining ways. This has been made easier since Traveller’s Tales started including voice acting in the LEGO games. While it was infinitely amusing to see beloved films pantomimed by the charming plastic bricks, the first LEGO Batman for flat for me, partly because I had to actively work out what was going on by the characters actions. It was still fun, but it broke the pacing of the game. LEGO Batman 3, however, features a stellar cast of voice actors including Troy Baker, Laura Bailey, Nolan North (what is this, Tales from the Borderlands? ), Travis Willingham, and many more, along with guest voices of Adam West, Conan O’Brian, and Kevin Smith, who all play themselves. Adam West also appropriately voices “1960s Batman,” who has the special trait of making POW!, BIFF!, and THWACK! exclamations pop up on every hit he lands. It’s kind of amazing. Another high point of Adam West’s inclusion is the “Adam West in Peril” in every level of the game, which is much more entertaining than the random “students in peril” found in the LEGO Harry Potter games. His commentaries whenever you find him stuck somewhere are always amusing, and just add to the lighthearted nature of the games. One problem I had with the levels was their wildly inconsistent length. Some would last upwards of half an hour, while others were over in 10 minutes. There were more than one occasion where I sat down to blast through a level real quick, only to have it drag on and on and on. Every time I thought the stage was over, it would take me to a new area. It was pretty frustrating. Having said that, there’s certainly no lack of content. I mean, half the fun of these games comes from replaying the levels once you’ve beat the game and unlocking all the characters and abilities so you can 100% it. In order to do that you must return to each stage and find the standard 10 mini-kits, the aforementioned Adam West in Peril, and a Red Brick that unlocks cheats that anyone who’s played a LEGO game previously should be more than familiar with. Plus there are three new character studs to be found in each stage, as well as dozens more that are hidden throughout the various hubs littering the world. Now the last LEGO game I played was LEGO Lord of the Rings, and that world was the largest and most ambitious I had yet seen in a LEGO title. LEGO Batman 3 has trumped it, allowing you to wander between many worlds including the Batcave, the Justice League Headquarters, and each of the Lanterns various planets, plus a few others. Once you’ve played their introductory level, you unlock them as explorable hubs. The vast areas of exploration are staggering, and if 100% completion is your goal, prepare to be in for the long haul. While I admit this is all very fun, I mentioned at the beginning that the game’s greatest triumph is also it’s worst downfall. Save for specific names and locations, the last four paragraphs could have been written about nearly any of the previous dozen LEGO games. If you’ve played one, you’ve pretty much played them all. It’s a formula that works, and very much an “if it ain’t broke, don’t fix it” situation. Still, it would be nice to see Traveller’s try something new and out of left field sometime. 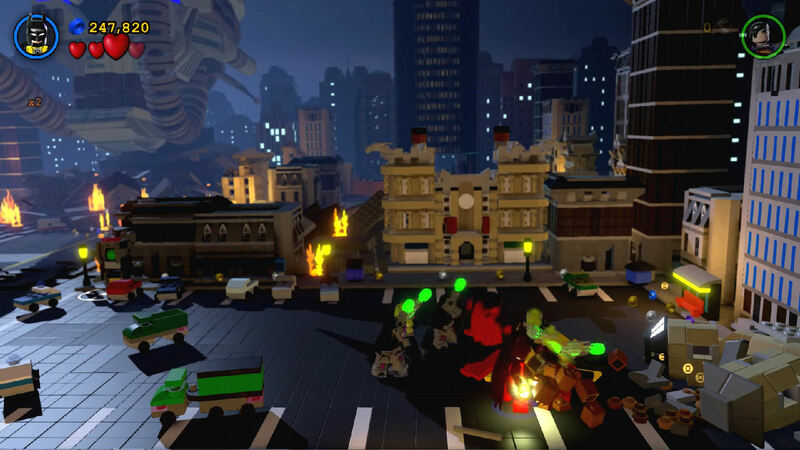 That being said, there *are* a few treats I found in LEGO Batman 3 that I hadn’t seen before in a LEGO title, which I had great fun with. There’s a Virtual Reality area where you can play various mini-games unrelated to the overall story, which are necessary in unlocking new vehicles. These mini-games include sumo-inspired battles where you must knock your opponents out of the ever-shrinking ring without getting knocked out yourself, as well as a series of twin-stick shooter levels that feel incredibly familiar to Geometry Wars, plus more that I have not yet unlocked. These mini-games were immensely fun, but much too short-lived. I would love to see an expanded arcade of LEGO mini-games like these in future titles. As I said before, the LEGO games don’t necessarily deviate from their tried and tested formula, but that’s hardly a terrible flaw. So long as they keep trying new things with each one, I’ll keep coming back for more. LEGO Batman 3 has successfully reignited my interest in the games, and would make any man, woman, or child happy to find under their Christmas tree or menorah these holidays. It’s not perfect, but it’s fun and fluffy. Plus, there’s no worry of stepping on the bricks in the middle of the night. LEGO Batman 3: Beyond Gotham was developed by Traveller’s Tales and published by Warner Bros. Interactive Entertainment, and is currently available for *deep breath* PlayStation 3, PlayStation 4, PlayStation Vita, Xbox 360, Xbox One, Wii U, Nintendo 3DS, PC, and iOS. A copy of the game for Xbox One was provided to Save/Continue for review purposes.